There are 27 bones, 29 joints and at least 123 named ligaments in the human hand. When the hand is kept wet, the skin of the palm wrinkles. Why? The exact mechanism is not known, but it is clearly controlled by nerves. When the nerve which supplies feeling to an area of skin on the palm is cut, that area of skin not only becomes numb, loses its ability to wrinkle when wet. It also loses the the ability to sweat. You cannot get a tan on your palm and underside of your fingers. White children are four times more likely than black children to be born with webbed fingers. A number of the English words which describe parts of the hand are ancient, with origins buried in the roots of language itself, suggesting a basic relationship between the development of the hand and the development of language. Black children are ten times more likely than white children to be born with extra fingers. Contrary to popular opinion, humans - homo sapiens - are not the only primates possessing oppossable thumbs. Chimanzees and monkees can oppose the thumb to the index digit. What makes the human hand unique in the animal kingdom is the ability of the small and ring fingers to rotate across the palm to meet the thumb, owing to a unique flexibility of the carpometacarpal joints of these fingers, down in the middle of the palm. This is referred to as "ulnar opposition" and adds unparalleled grip, grasp, and torque capability to the human hand. This feature developed after the time of Lucy, a direct human ancestor, who lived about 3.2 million years ago. The wrinkles on the back of the finger knuckles are actually dimples, and mark areas where the skin is attached to the tendon beneath the skin. Hand Surgery as a recognized surgical specialty did not exist until World War II. At that time, US Army Surgeon General Norman Kirk arranged for military hand injuries to be treated at regional specialty centers. Dr. Sterling Bunnell, a civilian general surgeon who had written a book about the care of the hand, was assigned the task of supervising and training a nucleus of hand surgery specialists. This group became the first generation of surgeons in the modern specialty of hand surgery. Finger joints only have wrinkles and creases if the joint moves. If a finger joint stops moving, the creases eventually flatten out. Fingerprints are a completely unique DNA imprint that is different in every single human being. No two human beings in the world have similar fingerprints. Almost 90 per cent of women and 80 per cent of men in the age group 75-79 years have x-ray evidence of osteoarthritis in their hands. When one curls the fingers into a fist, the fingertips naturally group together side by side. If the fingertips all bend together, they continue into the palm side by side. However, the natural tendency is for each fingertip to aim for the same point at the base of the thumb, which is obvious when touching each finger down to the base of the palm. For this reason, if a hand problem (stiffness, swelling, etc.) prevents a finger from meeting the side of the adjacent fingertip midway into making a fist, that finger will tend to cross over and overlap the adjacent finger when making a fist. Fingers are never perfectly straight. Usually, the index, ring and small finger each curve sideways slightly toward the middle finger, and the middle finger may curve toward either side. There are tons of words that include the word ‘hand’: handy, handwriting, handiwork, handle, handbag, handsome, handball, etc. The finger bones are straight on the back side, but curved on the palm side. When we bend our fingers into a fist, the finger bones produce a shape similar to a circle in a square, round on the inside, square on the outside. During the Gallic wars, Julius Caesar ordered the thumbs of captured warriers amputated so that when they returned to their country, they would serve as examples and be unable to bear arms again. This practice was later used in a number of wars and in the slave trade. When we make a fist, the fingertips curve through a spiral, not a circle. This is because the lengths of the finger bones are related in a way seen often in naturally occurring spirals. These spirals in turn relate to a mathematical series of numbers discovered by Fibonacci in 1202. In this series, each number is the sum of the previous two numbers: 0, 1, 1, 2, 3, 5, 8, 13, 21, ...and so on. The lengths of the finger bones approximate the ratio of the Fibonacci numbers 2, 3, 5, and 8. What sets our hands apart from other animals is our opposable thumbs—this means our thumbs and fingers can work together ( fun fact: koala bears also have opposable thumbs). 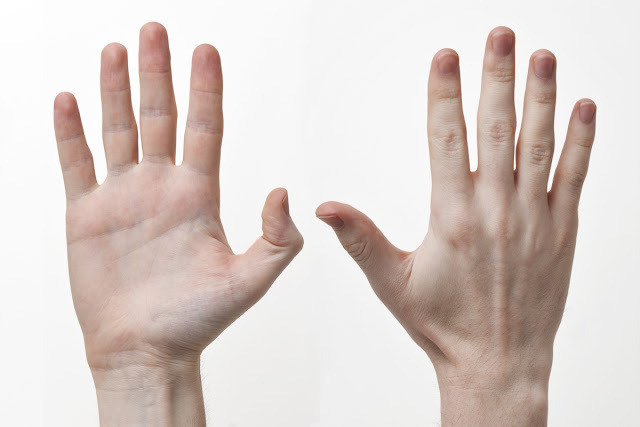 The average hand length for adult women is 6.7 inches. The average length for men is 7.4 inches. Fingers don’t have muscles—tendons in our fingers are moved by the muscles of the forearm. Men tend to have longer ring fingers than index fingers—girls vice versa. Hand surgeons say that the index finger is the best one to lose—if you had a choice. The index finger is needed the least. Your fingernails show your state of health—they can indicate problems such as mineral or vitamin deficiencies, liver trouble, thyroid or anemia. Some warning signs of deficiencies that show up on your nails may be that they are brittle, pale or spotted. The color of the nails and those small “moons” on each nail can identify the quality of oxygen level of the bloodstream and blood circulation. Our fingers are even more sensitive than the eyes—the fingertips have a large number of receptors responsible for sending messages to the brain. The vein on your ring finger is called Venna Amoris—it has a direct line with the human heart and is known as the vein of love. That’s why we wear an engagement ring on the left hand’s finger! Nails stop growing after death. Structurally, fingernails are actually modified hairs. Julius Caesar ordered the thumbs of captured prisoners to be cut off. 6% of all men and 9.9% of all women are left-handed. It takes up to 6 months for a fingernail to grow from root to tip.